On February 18 the leader of Israel, Benjamin Netanyahu, declared that Iran “is trying to establish this continuous empire surrounding the Middle East from the south in Yemen but also trying to create a land bridge from Iran to Iraq, Syria, Lebanon and Gaza. This is a very dangerous development for our region.” Netanyahu’s presentation was dismissed by the Iranian foreign minister as “a cartoonish circus,” but it was nonetheless a reflection of the policy of the United States, which is Israel’s mentor and unconditional ally. Last November Iran’s Supreme Leader Ayatollah Ali Khamenei suggested to President Vladimir Putin that Tehran and Moscow should cooperate more fully to try to dissuade the US from further disruptive dabbling throughout the Middle East. His opinion was that “Our cooperation can isolate America. The failure of US-backed terrorists in Syria cannot be denied but Americans continue their plots,” which is certainly the case, because although the so-called “moderate rebels” who were recruited to overthrow President Assad, with massive amounts of assistance from the Pentagon and the CIA, collapsed in ignominious failure, the US fandangos continue. Washington is not going to give up, and the Trump administration seems to relish being isolated by almost everyone. During his time in the White House, President Obama tried to get US-Iran relations on an even keel, and managed to temporarily overcome the Washington warmongers to some extent and push forward the tension-reducing, trade-improving, Joint Comprehensive Plan of Action (JCPOA) concerning Iran’s nuclear programme, which the BBC described as “the signature foreign policy achievement of Barack Obama’s presidency.” It was settled two years ago by China, France, Germany, Russia, the UK and the US in a most welcome example of international solidarity and downright common sense, and removed sanctions on Iran in exchange for Teheran’s agreement to limit its nuclear research and development. Federica Mogherini, the European Union’s foreign affairs representative wrote last year that the arrangement was achieving its main purpose of “ensuring the purely peaceful, civilian nature of Iran’s nuclear programme. The International Atomic Energy Agency – the United Nations’ nuclear watchdog – has issued four reports on the matter and has regularly verified that Iran is complying with its nuclear-related obligations. This means that the Iranian nuclear programme has been significantly reformatted and downsized and is now subject to intense monitoring by the IAEA. The joint commission – which I coordinate – oversees constantly the implementation of the agreement, meeting regularly, which allows us to detect even minor possible deviations and to take necessary corrective measures if the need arises. The JCPOA was indeed a marked diplomatic success on the part of Obama as well as being a victory for pragmatic common sense. So naturally the egregious Donald Trump has been trying to destroy it. On February 3 Trump enforced and it’s been downhill all the way since then. The sanctions that had been imposed and then withdrawn had been aimed at limiting Iran’s nuclear programme and the EU quite rightly wanted to confine them to nuclear-related agencies — the individuals and organisations directly associated with nuclear matters — but the United States, even in the Obama-guided era, wouldn’t confine itself to the main aspect of the agreement. It introduced sanctions of its own, intended to make it difficult for other nations to trade with Iran, which is consistent with its longtime spiteful attitude to Tehran’s government. The United States is determined to destroy Iran. For almost forty years, since the overthrow of the corrupt CIA-backed monarch, Mohammad Reza Shah Pahlavi, Washington has been on the warpath against the mullahs in Tehran. 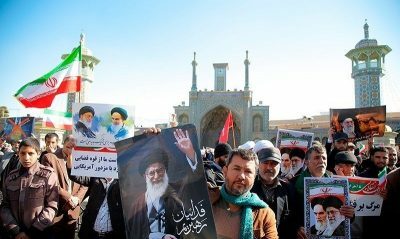 There wasn’t much to choose, comfort-wise between the Shah and his successor, the intensely religious Ayatollah Ruhollah Khomeini, but morally there was a chasm. The Shah was deeply unpopular and in the late 1970s there were mass demonstrations against him and the country dissolved into chaos. He had to go, and the only possible replacement was the Ayatollah who was living in exile in France, having escaped from the persecution of the Shah’s dreaded secret police, the Savak, in the 1960s. Two weeks after the Shah fled from Iran, the Ayatollah returned to Iran on 1 February 1979 in triumph and to a level of acclaim not shared by all its citizens. During the Shah’s dictatorship Iran was a good place to live for many people. There was no freedom of speech, but there was a lot of freedom to make money, especially in the US. There was sixty per cent illiteracy, but women were allowed to wear what clothes they wished and to move freely in society — except in the countryside, of course, where they were kept in their place as second-class citizens exactly as they are in present-day Muslim states such as US allies Saudi Arabia and Bahrain. What really vexes the extremists in Washington is the memory of humiliation when the US embassy in Tehran was attacked by mobs of students in November 1979, only ten months after Khomeini took over. There is little doubt that the attackers were students, but there is equally little doubt that they had the Ayatollah’s blessing (as it were) to storm the embassy and take the staff hostage. They demanded the return of the Shah to stand trial in Tehran — a ridiculous condition for cessation of their demented antics — but 52 US citizens were held hostage in Iran from November 1979 to January 1981, which was not just an awkwardness for Washington: it was an ineradicable embarrassment, an international degradation of colossal proportions that could never be forgiven. In 2002 the appalling President George W Bush, the man who took his country into its disastrous wars against Iraq and Afghanistan, conjured up the phrase the axis of evil, and put the world on notice that America would overcome any country that opposed it. His speech was dramatic and he declared that “North Korea is a regime arming with missiles and weapons of mass destruction, while starving its citizens” which was true. And still is true, after 15 years in which the US has managed to do exactly nothing to discourage North Korea from arming itself against invasion. Then he said that “Iraq continues to flaunt its hostility toward America and to support terror. The Iraqi regime has plotted to develop anthrax and nerve gas and nuclear weapons for over a decade” and a few months later he invaded Iraq to destroy its weapons of mass destruction, which of course didn’t exist. Since the era of the Bush wars, the world has certainly known no peace. Washington’s Military Industrial Complex has flourished while its soldiers died for nothing but profit. The present US campaign against Iran is aimed at destroying the country economically and thus encouraging a violent revolution. And many western observers consider there’s a lot to be said for rising up against the ayatollahs, because they’re a bumptious arrogant unforgiving bunch of bigots who repress women and democracy. So why doesn’t the US have the same thoughts about Saudi Arabia and the Gulf States, whose unelected princely rulers repress women and do not tolerate democracy? What a horde of humbugs. Washington is intent on destroying Iran, and the contents of that tweet could hardly be better reason for supporting Tehran in its struggle against the growing menace from the Trump-supported military-industrial complex. The world is watching.